Are there physical exercises that help my dog to settle? Exercises that use gentle and positive handling can help to increase the enjoyment and decrease any fear associated with handling and restraint. (Also see our handout on 'Puppy – Handling and Food Bowl Exercises'). In addition, they can be used to help settle your dog and achieve a relaxed state if the dog is excited or aroused. Verbal exercises can and should also be used to help achieve a relaxed state (See our settle exercise handouts). Handling exercises should begin from the day you obtain your new puppy. (See our handout on 'Puppy – Handling and Food Bowl Exercises'). While the physical contact and attention you provide may be sufficiently reinforcing for most puppies, food treats can also be paired with handling to mark and reward the desirable response. One important principle to always keep in mind is that the hand should always be an indication that something good is about to happen (the hand is a friend). This means that physical punishment and forceful handling must be avoided. What physical exercises might serve as a relaxation tool? The handling exercises that you practice with your puppy will serve as the basis for further handling and restraint. At times such as grooming, lifting, bathing, nail trimming, teeth brushing, ear cleaning or other forms of physical restraint, the puppy that has become accustomed to these forms of handling should display little or no resistance. In fact, handling exercises might be used to calm and relax the pet when it is excited or anxious. Two specific forms of handling, designed specifically as relaxation exercises are TtouchTM and SOFT. While these are specific techniques, any physical handling (e.g. massage, tummy rubs) that is associated with a positive outcome can be a valuable training exercise. In addition, by withholding affection when it is solicited by the pet, and providing it primarily in the form of these handling exercises, the motivational value increases. Physical exercises are intended to be used only with friendly, non-aggressive dogs. If you think your dog might become aggressive, do not begin without first discussing this with your veterinary behavior consultant. If your dog growls or attempts to bite, becomes fearful, or struggles excessively during these exercises, immediately discontinue them and seek the advice of a behaviorist or trainer. TTouch protocols are discussed in a separate handout. What is the SOFT exercise and how does it work? The SOFT exercise was described by David Tuber, PhD, 1986 as a means of achieving a calm and settled response on command, using gentle physical manipulation. The SOFT exercise is used to get the dog in a relaxed position and relaxed state on its side with its back against the owner's knees and its head resting on the floor. The most practical method to achieve this is to kneel on the floor with the dog standing sideways to you. Say "SOFT" as you reach over the dog's back and grip the front and back legs closest to you, near the paws. The limbs are then gently raised which pulls the dog back onto your lap, preventing it from falling. With the ramp provided by your knees, the dog is then gently eased to the floor and is maintained in this position using gentle pressure from both forearms and a soothing voice. The dog's legs should continue to be held so that they cannot make contact with the floor until the dog is settled and relaxed. Some resistance can be expected and this will need to be overcome with a firm but gentle approach. Once the dog begins to relax and its resistance decreases, pressure should be gradually released, but reapplied if the dog begins to struggle or rise. The goal is for the dog to learn that relaxation leads to pressure release. Once there is no further resistance, the pressure can be entirely removed and replaced by gentle stroking along the neck, shoulder and back. Massage and stroking should continue for at least a minute after the dog has stopped resistance. Finally, the hands should be removed with the dog remaining in place before the exercise ends. During subsequent practice session, the length of massage should gradually be increased. "Over time the dog should gradually be taught to receive reinforcement for calmer and more relaxed responses." 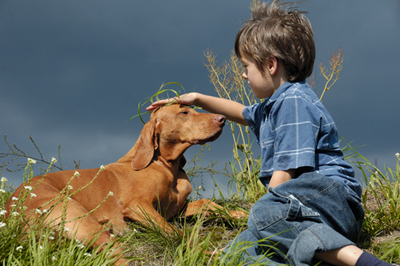 Over time the dog should gradually be taught to receive reinforcement for calmer and more relaxed responses. Relaxed ear carriage and facial expressions and a slow relaxed breathing should gradually be shaped. Each time you begin the exercise, the "SOFT" command should be given. By practicing this exercise multiple times a day, the dog should initially learn to assume the relaxed posture with a minimum of restraint and ultimately learn to assume the SOFT position on command. A number of products have been recently introduced such as an anxiety wrap and a calming cap that may help to reduce anxiety, perhaps by distracting the pet, or by helping it to settle and focus on something other than the stimuli. A head halter is another means of insuring that the pet will focus and calm.